Transolid creates and manufactures high-quality surfacing solutions for the home and commercial environments. From solid surface to quartz to granite, Transolid offers an elegant and durable surface for any taste or budget. For the home, they offer vanity tops, solid surface shower walls and pans, solid surface tub surrounds, toilets and lavatories, and solid surface and granite kitchen sinks. When you buy a Transolid Beckett Pull Out Single Handle Kitchen Faucet online from Wayfair, we make it as easy as possible for you to find out when your product will be delivered. Read customer reviews and common Questions and Answers for Transolid Part #: T3520-PC on this page. If you have any questions about your purchase or any other product for sale, our customer service representatives are available to help. Whether you just want to buy a Transolid Beckett Pull Out Single Handle Kitchen Faucet or shop for your entire home, Wayfair has a zillion things home. Based on 117 total reviews. It's utterly gorgeous!!!! I also bought the tile at wayfair so included photos to show how it all came together. This is beautiful. Our installer was very impressed with it. Instructions are not very clear - even the installer has had trouble with them. We are looking forward to having it fully assembled! The only hiccup we had was with the delivery people contracted by Wayfair. They cancelled delivery twice (once right in the middle of the delivery window), but Wayfair was very fair in offering a slight discount due to the inconvenience. Love Wayfair and this shower. The sink vanity top is fabulous. Color is great and fits well with the farmhouse look. Great upgrade to my bathroom!! Easy to install. Sink drains great. Arrived in 2 days with No damage!! Very happy with this sink-good description- exactly what we expected! Had it about a month, looks even better than the low price would suggest! Great quality product. Easy to install. I use this corner seat as an alternative to a full bench which often goes unused. The marble is close to a true white. Happy with shipping, packing and product. Beautiful tub filler! The oil-rubbed bronze look is perfect and we get a lot of compliments! The water pressure has been great and my husband had no trouble installing it. This sink is not the size it says it is, it's bigger. It will NOT fit in a 33" cabinet. The overall width is NOT 31 inches, it's 32.5. Great looking sink. A little more towards being a gray color than expected. This black granit composit sink is a perfect compliment to my granit countertops. If you are not able to or choose not to have a farm sink, this is a perfect substitute..... I love the depth and the size, it is definitely big enough for all my large pots and pans that I have. Rated 4 out of 5 stars.14 total votes. Ideal for smaller areas, the Blanco Torino, Jr.™ offers all of the features of its larger counterpart, but with a more compact design. Rated 4 out of 5 stars.38 total votes. Rated 4 out of 5 stars.31 total votes. Versatile and dependable products are a staple of the Reliant+ Combi collection. This single handle kitchen faucet make your selection more personal. A deluxe pull-out spray with adjustable spray patters makes this faucet perfect for all your cooking and cleaning needs. Complete with a swivel spout and braided flexible hose, this kitchen faucet will be the perfect addition to any home. Blossom’s certified high-quality Pull-Down Single Handle Kitchen Faucet offers precision control while delivering considerable levels of performance. Blossom faucet’s super sleek appearance was designed specifically to ensure strict operational testing on the internal mechanisms so each ceramic disk cartridge will provide superior performance. The faucet is made with solid brass which is the known to be the most durable material in the industry and recognized for its resilient longevity and sturdiness. This faucet allows for long-lasting beauty for many years to come. Add high-functionality and an elegant touch to your kitchen sink with Ultra Pull Out Touch Single Handle Kitchen Faucet. 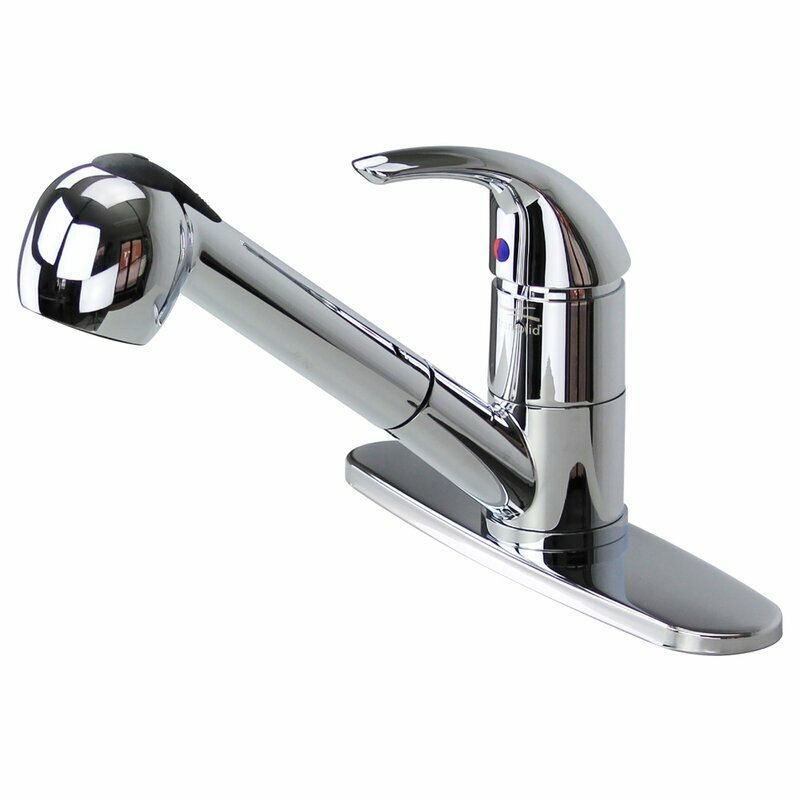 Made from premium-quality material, this faucet has a sturdy and durable structure. It is available in multiple finishes to choose from. The faucet includes an optional deck plate and is ideal to be installed with one to three holes. It has a pull-out spray head that adds to its functionality. The faucet has a single handle for convenient use. The faucet has a ceramic disc cartridge that promises drip-free performance. This Pull Out Touch Single Handle Kitchen Faucet from Ultra Faucets has a spout that swivels for an easy cleaning process. Rated 3 out of 5 stars.12 total votes. Hardware House LLC offers thousands of high quality products including faucets. Rated 4 out of 5 stars.72 total votes. Inspired by nature and featuring Delta Diamond seal technology, the Linden Kitchen Series featuring Multi-flow wand offers a water-efficient product with an enhanced flow option to fill the sink, pots or vases. The design was inspired by a strong presence in nature like that of a tree with reaching branches. Rated 5 out of 5 stars.85 total votes.